The “promised land” was described to the Israelites as “a land whose stones are iron, and out of whose hills you can dig copper” (Deuteronomy 8:9). Copper was mined in the Arabah of Israel as far back as the 13th-12th century B.C. Copper is still mined at Timna about 25 miles north of Eilat (close to Ezion-geber). Belgian engineers made a survey proving the presence of 100,000 tons of metallic copper. Iron ore has been found in the Negev and in eastern Upper Galilee (Vilnay, The Israel Guide, 17). The Bible does not say that Solomon had copper mines at Ezion-geber, but the presence of mining facilities dating to the 10th century B.C. indicates that this may have been one of the reasons why the King built a port and had a navy stationed there (1 Kings 9:26-28). Ezion-geber was more than 220 miles from Jerusalem. The copper provided a good medium of exchange for gold, spices, and other items that Israel needed. The Pillars of Solomon. These massive pillars at Timna have been associated with Solomon for a long time. Photo by Ferrell Jenkins. It is true that copper smelting was done in the Arabah in the time of Solomon, but Glueck later changed his mind about the building he had formerly identified as the refining plant. In 1962 Beno Rothenberg demonstrated that the installation at Tell el-Kheleifeh could not have been for copper smelting. Glueck was convinced by the findings of Rothenberg that the apertures in the building “resulted from the decay and or burning of wooden beams laid across the width of the walls for bonding or anchoring purposes.” This does not affect any statement of the Bible, but it does mean that the old argument about the copper refining plant found in the Arabah is no longer valid. Glueck’s identification of Tell el-Kheleifeh with Ezion-geber is no longer accepted. We plan to follow this post with one on Solomon’s seaport. resulted in a new chronological framework for Iron Age copper production in this region. The main period of copper smelting in the southern Arabah was during the 10th century B.C.E., and the extent of New Kingdom Egyptian control over copper production in Timna was more limited than previously believed. (“A New Chronological Framework for Iron Age Copper Production at Timna (Israel).” BASOR 367 (2012), p. 65. 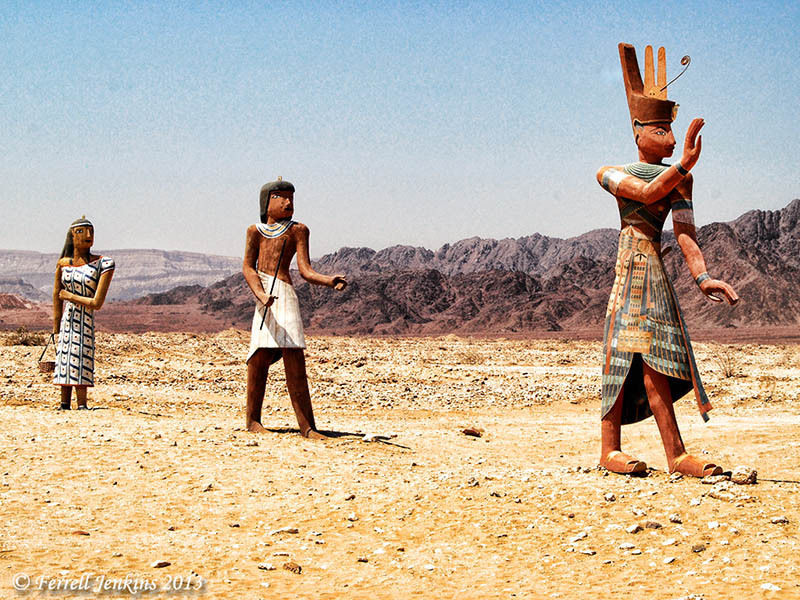 Egyptians welcome visitors to the Timna Park. Perhaps some Israelites should be added. Photo by Ferrell Jenkins. Other post having to do with copper may be read here, here, and here. This paragraph provides documentation for some of the material mentioned above. For more information one may check the following books or articles by Nelson Glueck: “The First Campaign at Tell el-Kheleifeh,” Bulletin of the American Schools of Oriental Research, Oct., 1938; The Other Side of the Jordan, 1940; Rivers in the Desert, 1949; the change was announced in “Ezion-geber,” The Biblical Archaeologist, Sept., 1965. 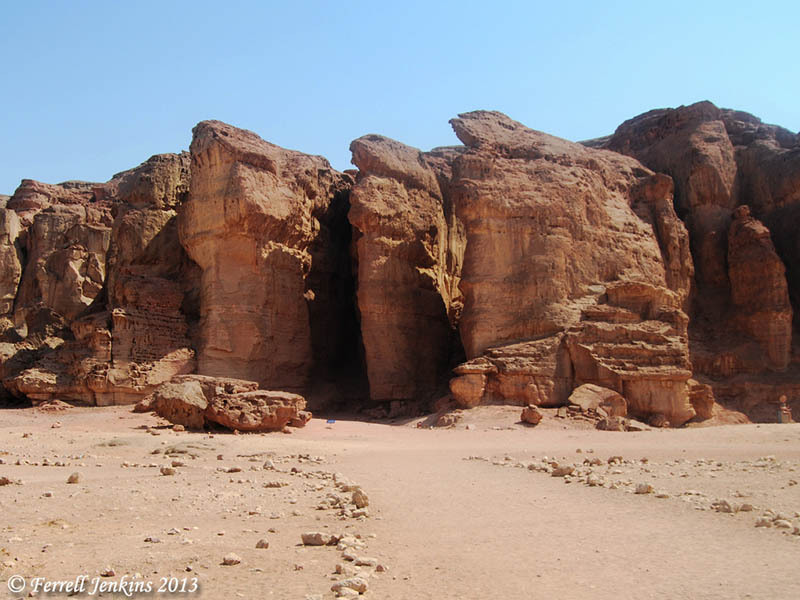 This entry was posted in Archaeology, Bible Lands, Bible Places, Bible Study, Culture, Egypt, Israel, Jordan, Old Testament, Photography, Travel and tagged copper, Solomon. Bookmark the permalink.